Pain and Glory (Dolor y Gloria), Spanish director Pedro Almodóvar‘s new film about a melancholic filmmaker played by Antonio Banderas, opened in cinemas across Spain this weekend – and is being seen as a thinly disguised autobiography and the most retrospective work in his 40-year career. The Oscar-winning writer and director (for best foreign language film in 2000 with All About My Mother and for best original screenplay in 2003 with Talk to Her) has always vowed he would never publish an autobiography, but he has admitted he is ’emotionally naked’ in Pain and Glory – his 21st film – which deals with the themes of love, mourning, and reconciliation. ‘I felt the need to provide a very introspective look, including into my darkest parts and to mix that with the brightest memories of my childhood,’ the 69-year-old said during an interview with Spanish public television TVE. Pain and Glory cuts back and forth in time as it follows the filmmaker in his twilight years reflecting on the choices he’s made in life. It features scenes of a young boy discovering he is gay in a rural and deeply Catholic Spain and of 2 mature men who kiss each other tenderly on the mouth. ‘I am master of my stories and I impose my universe with all the pride and all the arrogance that this allows. And in my universe there are 2 older gentlemen who kiss with passion, and after one of them returns to his life with his wife and children,’ Almodovar told online Spanish newspaper eldiario.es. Pain and Glory reunites many actors from the different periods of Almodóvar’s distinguished career. Almodóvar first cast Banderas, 58, in his 1982 film Labyrinth of Passion, then went on to give him leading roles in 6 other movies. In Pain and Glory Banderas plays Salvador Mallo, an auteur director struggling with issues of creativity brought on by ill health. He appears with Almodóvar’s trademark spiky white hair and bright clothes but does not imitate the director’s mannerisms. The movie also stars longtime Almodóvar favourite Penelope Cruz, who plays the main character’s young mother – reprising a very similar role to the one she played in Volver – a woman engulfed in sadness who lights up and sings while washing clothes in a river. Spanish actress Julieta Serrano, who appeared in his first feature film, the 1980 camp comedy Pepi, Luci, Bom, depicts the mother when she is elderly. Almodóvar, behind films such as Women on the Edge of a Nervous Breakdown and Julieta, has also stressed in several media interviews that the film contains many fictional moments which bear no resemblance to his own history. For example, the director in the movie falls in love with a builder as a 9-year-old boy (played by Asier Flores). Almodóvar says this never happened to him, though he admits it could have. In the movie, the director also becomes hooked on heroin. 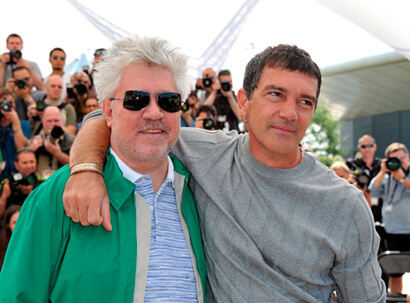 Almodóvar said he never touched the drug, preferring instead cocaine in his younger days. While reviews in Spain for Almodóvar’s recent movies have been mixed, this time around critics have been mostly positive about Pain and Glory. El Mundo said the film ‘achieves a level of perfection which is difficult to surpass,’ while online newspaper El Espanol called it Almodóvar’s ‘most sincere’ movie.